There are several versions of this product available. If the document you are searching for is not present, click here to request it. Spencer Italia s.r.l. a socio unico has moved to new premises and as from the 1st June 2017 the registered address is Via Provinciale, 12 - 43038 Sala Baganza (PR) - Italy. All documents on this website are under review. Where the document of interest still contains the old address, you can contact us by writing to export@spencer.it to receive the updated version. In the past few years we have dedicated a lot of time to those customers operating in hospital triage and maxi-emergency units that require a personalised solution to their needs in order to meet their requirements related to medical care in exceptional situations. Applied research has brought us innovative results in terms of transport and ergonomics. Porta Stock is equipped with an essential frameworkin galvanised steel, which makes it extremely resistant to atmospheric influence. Thanks to a simple cinematic system it is very compact and helps resolve space-related problems during transport and warehousing. The most simple and economic system enabling to have a patient platform available at any time. 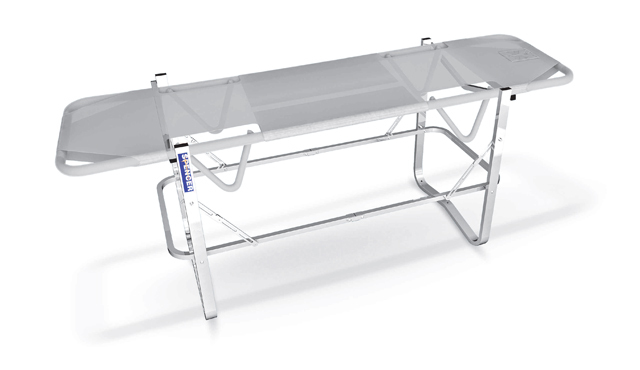 Designed for the Stock Series, it adapts to most stackable stretchers.